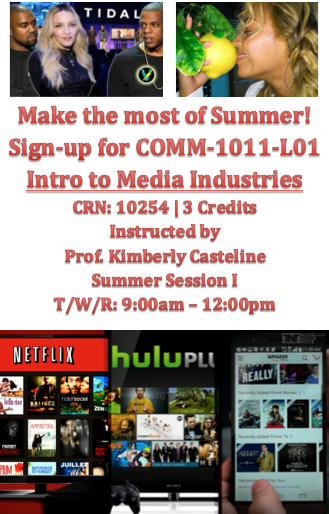 Claudia Rivera May 3, 2016 May 3, 2016 No Comments on Summer ’16 Course @ LC Campus: Intro to Media Industries NOW Open for Registration! Learn about some of the most important industries in New York City! We consume media products daily but rarely think about the complex labor, production, and distribution systems that manufacture the broadcast, digital, and print messages around us. This interactive summer course will give you an overview of the television, film, print, music, gaming, advertising and PR industries. You will learn their institutional, social and technological histories and how the new digital era is shaping what we see and hear. This course counts toward the CMS Major and Social Science Requirement.